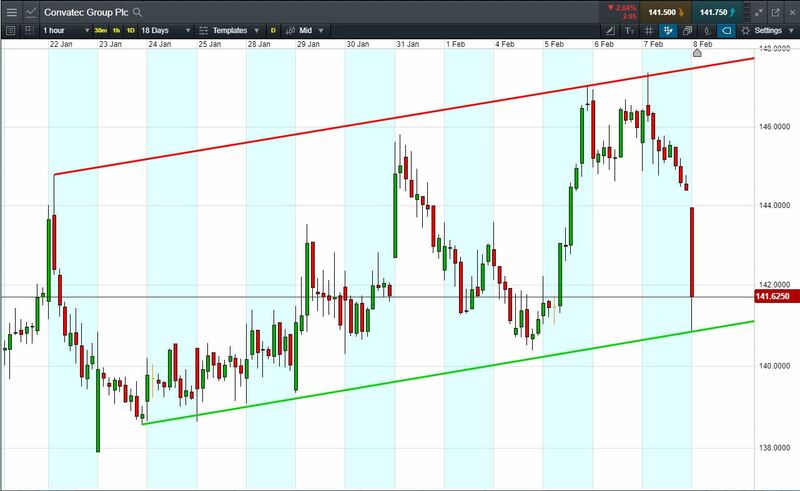 Will Convatec break support, or will it rise back to 147p? Rising channel since late January. Will the pattern repeat itself, rising back to 147p? 26 Oct: Wound care maker obtained clearance from the US health regulator. Let’s say you like the Convatec range, you think it’s heading back up to 147p again. You decide to buy exposure to £10,000 worth of Convatec using a CFD, at the current price of 141.6p. To do this, you need £2,000. Let’s assume Convatec rises back to 147p (+3.8%). Your profit would be £380, from your initial investment of £2,000. Conversely, let’s assume you open the above position, and place a stop-loss at 2% from the current price. Convatec falls 2% and hits your stop-loss. Your loss would be £200.